Sound waves are longitudinal vibrations which produce pressure waves. In dense materials, sound travels faster than in less dense materials, because the vibrating molecules push against others closer to them, so energy is transmitted more quickly. We usually hear sound through the air. 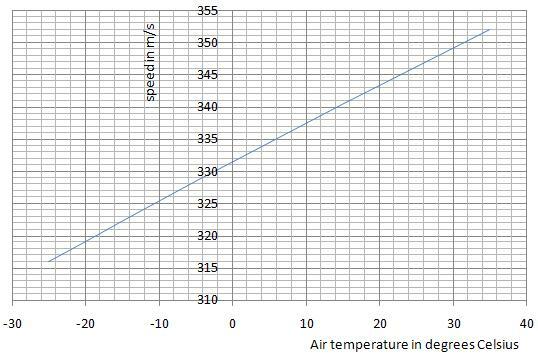 In air, speed increases with increasing temperature, as shown. Frequency is the number of waves every second. Pitch is what we actually hear, or the sensation of frequency. An octave is the name we give to a frequency ratio of 2:1 ( example 256Hz to 512Hz). Timbre is the quality or the musical aspects of the note we hear, so we can tell the difference between the same note played on a violin or a trumpet. These three waves show the idea. Each is playing the same note and the waveform is recorded and displayed on an oscilloscope. e) is a French horn, f) is a clarinet and g) is a violin. Notice that the spacing of each wave is the same – the same frequency – and their loudness (amplitudes) are the same as well. It’s just that they ‘sound different’. Now for some biology, This link shows how the energy of the vibrating air particles gets converted into sound which we can hear. Our ears are sensitive to a range of frequencies between 20Hz and a maximum of 20,000Hz (20kHz) I am very old, and can only manage about20Hz to 11kHz, but my baby grandson can hear right up to 20kHz. My dog can hear up to 35kHz. If I had a pet bat (which I haven’t!) it could hear a sound at a frequency of 150kHz. Is there a sort of ‘rule’ here? Do big animals hear at lower frequencies than little ones. Perhaps. Have a look at this… You know what… maybe not. Also, we as humans don’t hear all frequencies equally well. Here’s a graph from a diving site. Look at the black airborne one first. We need very much higher pressure waves at low frequencies to hear them well, and much lower pressure (or smaller amplitude, quieter sound) at about 3-4kHz, so we hear these best. Devices that make a noise to attract our attention make sounds in this sort of range so we don’t miss them. My washing machine plays me a little high-pitched song to tell me when it’s done. Also, look at the blue part of the graph. Notice that we hear better underwater, perhaps because sound travels almost five times faster than in air. We know already that all EM waves are transverse electromagnetic oscillations, travelling at 300 million m/s in free space. We also know that a glass block slows them down to about 200 million m/s. We can only see a little bit of the whole spectrum – which means everything there is to see. Our limit is anything from a wavelength of 0.0000004m (violet light) to 0.0000007m (red light). 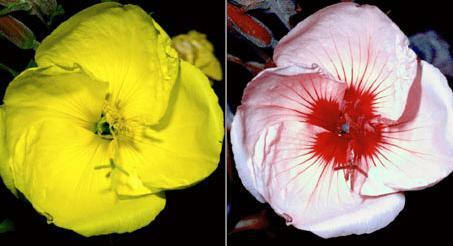 Bees can see in the UV, so this is how they see a yellow primrose, homing in on its UV emissions in the centre. Radio and TV waves might have a wavelength of several hundred metres, whereas X-rays, gamma rays and cosmic rays might have wavelengths smaller than the diameter of an atomic nucleus. Here’s the picture that tells the whole story. Everything you really need to know is on it. Dowload a copy or pick one up from me in school. A few more little details. Microwaves are just low energy infrared rays. Their energies are such that water, fat and sugar molecules absorb them very efficiently. When you microwave food, all you’re doing is boiling the liquid inside it, which is why it’s so fast. For comparison, an hour a day for a year on a mobile phone produces about 10kJ of energy, equivalent to 10s in a microwave oven. X rays are emitted when electrons are fired at metal targets. We won’t go into details here, except the only real difference between these and gamma rays is that gamma rays are emitted spontaneously from excited nuclei. X rays pass through human tissue, being absorbed by denser material. In 1901, Wilhelm Roentgen was the first person ever to win the Nobel Prize for Physics. His discovery revolutionised the medical world. A series of experiments helped him notice that barium platinocyanide emits a fluorescent glow – X-rays. In fact, he caught sight of the glow ‘out of the corner of his eye’. Had he been looking directly at the powder, he’d’ve missed it. Combining his observation with a photographic plate and his wife’s hand, he made the first X-ray photo, and so made it possible to look inside the human body without cutting it open first. Here’s the first ever X-ray. Nice ring, Mrs Roentgen..
Microwaves have just the right amount of energy ( a wavelength of a few cm) to heat water very efficiently. 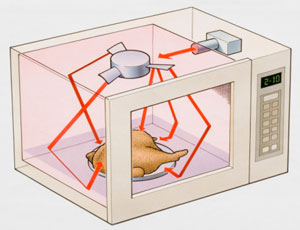 So, a microwave oven gives the microwave energy to the water molecules in the food and the food ‘cooks itself”. The light that we can see (from red to violet) is only a tiny fraction of a family of transverse electromagnetic oscillations. 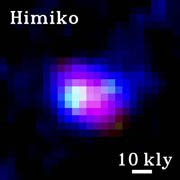 Beyond the red – the infrared, at longer wavelengths than visible light. All bodies above absolute zero emit infrared. If when you abandon your stolen car and run for the trees, you can’t hide. The IR detectors in the police helicopter will pick you out even when you think the trees are hiding you, because you’re warmer than they are. Thermal infrared imagers are detector and lens combinations that give a visual representation of infrared energy emitted by objects. Thermal infrared images let you see heat and how it is distributed. A thermal infrared camera detects infrared energy and converts it into an electronic signal, which is then processed to produce a thermal image and perform temperature calculations. Thermal imaging cameras have lenses, just like visible light cameras. But in this case the lens focuses waves from infrared energy on to an infrared sensor array. Thousands of sensors on the array convert the infrared energy into electrical signals, which are then converted into a false-colour image. Too much exposure to the Sun’s infrared gives you sunburn – you’re being slowly cooked on the surface of your skin. Beyond violet is UV. This image is a digitally enhanced representation of the Sun’s UV fingerprint. The Sun’s ultraviolet rays have shorter wavelength than visible light, so they carry more energy and penetrate deeper into the skin. Special cells called melanocytes have a pigment, melanin, which turns brown in UV light, so you get nicely suntanned. Too much exposure to solar UV can set the skin cells off into crazy, random divisions and you can get melanoma, a form of skin cancer. So, cover up or wear SFP 50! 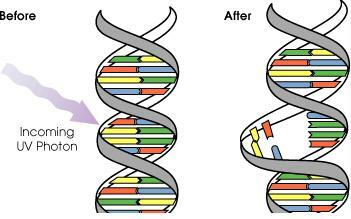 This is what happens to your DNA – more or less. The UV radiation behaves like ‘light-bullets’, chipping bits off the delicate double helix structure which gets so badly damaged it can’t repair itself properly. Stephen Hawking is ill, poor man and hospitalised in Cambridge. My imagination is caught by quantum cosmology, the notion that representing the Universe as one of many by a probabilistic wavefunction might or might not be at least a partial explanation of its existence. Yet, as Einstein remarked, it ‘gets us no nearer to the secret of the Old One’. Hawking’s cosmology goes further than Einstein’s. Theists argue, in my view more correctly, that whatever begins to exist has a cause, the Universe began to exist, therefore the Universe has a cause. The concept of ‘beginning’ is so intuitively obvious, so it’s unwise to try to construct an argument in favour of it, for any proof of the principle is likely to be less obvious than the principle itself. And as Aristotle remarked, one ought not to try to prove the obvious via the less obvious. The old axiom that “out of nothing, nothing comes” remains as obvious today as ever. Philosophers are often adversely affected by Heidegger’s dread of “the nothing,” and conclude that “the most reasonable belief is that we came from nothing, by nothing, and for nothing”, a sort of Gettysburg address of atheism, perhaps. Nothingness is however, not the same as ‘hiddenness’. Unlike Dr Hawking, who clearly is a closet Gnostic, most of the rest of us have no idea about what God is thinking, much less know his mind and whether or not the notion of a beginning prefigures it. Karl Barth (a personal favourite) used to teach on the ‘otherness’ of God – in brief the concept that predestination is mankind having been chosen for salvation at the permanent cost of God’s ‘hiddenness’ – in exchange for a glass at the bierkeller. A very fair exchange. We all know about refraction. Light changes speed and maybe direction as it goes from (say) air to glass. If the glass is a particular curved shape, we can determine the direction of the refracted rays and get them to meet at a point. 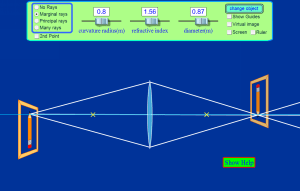 focal length, principal axis, focal point. TASK 1. Measuring the focal length of a converging lens by holding it a long way from a window and seeing the real, inverted, smaller image produced on the wall. Real images are formed by real rays of light, which is why we can project them on to a wall or a screen and they’re the same colour as the object forming them. Check this simulation out. You can change the thickness of the lens and the object position. Look for real and virtual images – the simulation can show both. We can draw diagrams to show what is happening when the object is at a particular distance from the lens. Start with one like this. The object is more than 2F away from the lens. Draw two rays, one parallel to the PA, the other through the centre. The image is where they meet. Task 2. Using a convex lens as a magnifying glass. Hold your lens close to some writing. Notice what happens as you move the lens a little further from the page. 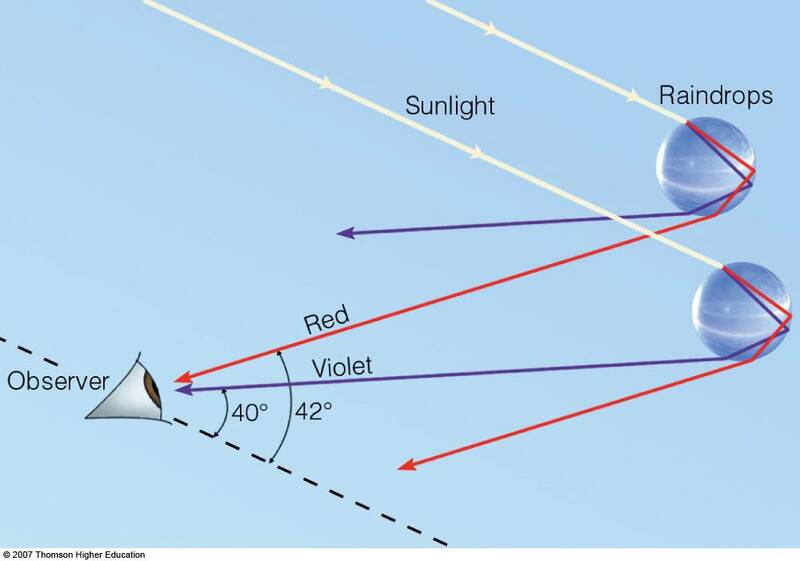 We can draw a similar diagram with two rays as before to show what’s happening. Notice that the two rays diverge (get further apart). If we want to find the image we have to draw dotted lines backwards. Where they apparently cross is where the light appears to come from. This is the image position. This time, the image is virtual, magnified and the right way up. Writing looks bigger, we’ve created a magnifying glass. Now go back to the simulation and get it to show a magnifying glass for you. 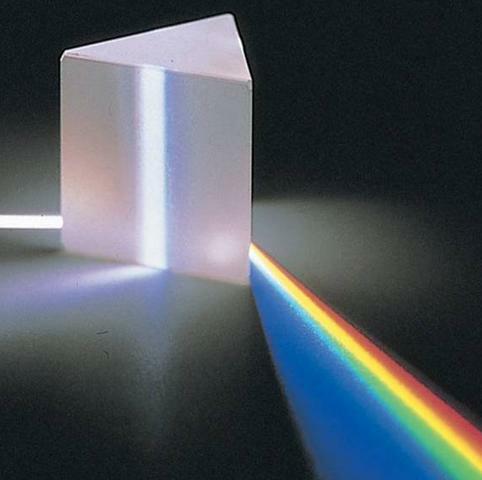 White light, so-called, isn’t really white, but a mixture of red, yellow, green, blue, indigo and violet. It can be dispersed or spread out by a triangular prism. Read Out Your Good Book In Verse, alternatively Richard Of York Gave Battle In Vain, referring to the death of both Richard and his son during the Wars of the Roses at the freezing cold Battle of Wakefield in 1460, are both memory tags to remember the spectral order in decreasing wavelength. You can blame Isaac Newton for ‘indigo’ which is a kind of dirty purple . He wanted seven colours, one for each day of the week, the number of known planets at the time and the number of notes in the major musical scale. Blue light is refracted by a prism more than red because it travels more slowly in glass. Have a look. Check this image out which shows you how rainbows are made. Separate raindrops disperse white light as shown here. Red on the top, blue on the bottom. Suppose you want to shine a torch beam down a long, straight hallway. Just point the beam straight down the hallway – light travels in straight lines, so there’s no problem. What if the hallway has a bend in it? You could place a mirror at the bend to reflect the light beam around the corner. What if the hallway is very winding with multiple bends? You might line the walls with mirrors and angle the beam so that it bounces from side-to-side all along the hallway. This is almost exactly what happens in an optical fibre, except that mirrors tend to scatter the light too much, so we arrange for it to be totally internally reflected inside layers of different glasses with reflective cladding around the outside. Because the cladding does not absorb any light from the core, the light wave can travel great distances. In this image, only one layer of core is shown for greater clarity. Electrical signals and light can be transmitted for long distances using total internal reflection in a length of optical fibre, by using carefully chosen glasses with slightly different refractive indices, bundled together in lots of fibres. However, some of the light signal degrades within the fibre, mostly due to impurities in the glass. If we want to see inside the body, an endoscope allows us to do so. A piece of optical fibre can direct light into body cavities and receive TV images back, enabling doctors to make accurate diagnoses. This is a well-lit endoscopy image from a fortunately healthy human stomach. Periscopes are devices to ‘see over’ from the Greek. Properly angled mirrors are OK to see over the fence at the football match, but submarines need a bit more clarity. The same trick was used in WW1 when soldiers needed to see over the trenches to keep an eye on the enemy. There’s nothing really new about periscopes. Johannes Gutenberg (he of the Gutenberg Bible) patented a design so that pilgrims could see over crowds at religious festivals. In 1430!